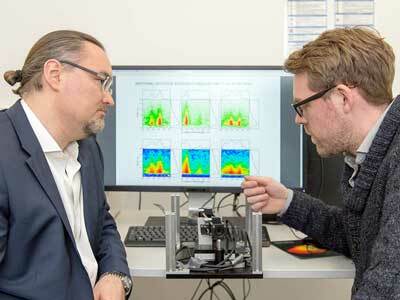 (Nanowerk News) While spectroscopic measurements are normally averaged over myriad molecules, a new method developed by researchers at the Technical University of Munich (TUM) provides precise information about the interaction of individual molecules with their environment. This will accelerate the identification of efficient molecules for future photovoltaic technologies, for example. An international team led by the TUM chemist Professor Jürgen Hauer has now succeeded in determining the spectral properties of individual molecules (PNAS, "Single-molecule excitation–emission spectroscopy"). The researchers acquired the absorption and emission spectra of the investigated molecules over a broad spectral range in a single measurement to accurately determine how the molecules interact with their environment, capturing and releasing energy. Normally, these kinds of measurements are averaged over thousands, even millions, of molecules, sacrificing important detail information. "Previously, emission spectra could be routinely acquired, but absorption measurements on individual molecules were extremely expensive," explains Hauer. "We have now attained the ultimate limit of detectability." The new method is based on a compact, merely DIN-A4-sized instrument that the Munich chemists developed in collaboration with colleagues at the Politecnico di Milano. The key: It generates a double laser pulse with a controlled delay in between. The second pulse modulates the emission spectrum in a specific manner, which in turn provides information about the absorption spectrum. This information is then evaluated using a Fourier transformation. "The primary advantage is that we can, with little effort, transform a conventional measurement setup for acquiring emission spectra into a device for measuring emission and absorption spectra," says Hauer. The measurement itself is relatively easy. "At nine o'clock in the morning, we installed the apparatus into the setup at the University of Copenhagen," says Hauer. "At half past eleven, already, we had our first useful measurement data." Using the new spectroscopy method, chemists hope to now study individual molecules, to understand phenomena such as the energy flow in metal-organic compounds and physical effects in molecules when they come into contact with water and other solvents. The influence of solvents at the single molecule level is still poorly understood. The chemists also want to display the flow of energy in a time-resolved manner to understand why energy flows faster and more efficiently in certain molecules than in others. "Specifically, we are interested in the transfer of energy in biological systems in which photosynthesis takes place," says Hauer. The researchers have cast their view on the light collection complex LH2 for future applications. "Once we understand the natural light-harvesting complexes, we can start thinking about artificial systems for deployment in photovoltaics," says Hauer. The findings could form the basis for future technologies in photovoltaics. The goal is the development of a novel organic solar cell.